Back by popular demand! Our six self-guided walking tours of Downtown Rochester have entered the 21st century and can now be used on mobile devices! Simply click on the links below and access the Landmark Walking Tours using your Google Maps app on your smart phone or tablet OR download and print the PDFs from home before you head out the door. Click here for an interactive map of the six tours. This route mixes historic buildings with contemporary office and hotel buildings. There are 24 sites along the tour; including 2 districts, 3 bridges and 13 buildings listed in the National Register of Historic Places. Rochester city streets on a whole are pedestrian, wheelchair and stroller friendly. In particular, for those taking this tour it is possible to stay exclusively on city sidewalks, with only a few driveways and alleys to cross. On this walking tour, you’ll discover the 100-Acre Tract, Rochester’s oldest “neighborhood,” and see the Court House Square, now the home of the Monroe County Office Building and Rochester’s former city hall. Welcome to Kodak’s neighborhood! Rochester’s tradition of re-purposing older buildings for new uses is most evident in this area, both a National Register Historic District and a city Preservation District. The tour of High Falls and Brown’s Race features a panoramic view of the Genesee River’s 96-foot falls and spectacular gorge plus a visit to an urban cultural park that celebrates Rochester’s earliest industrial area. This tour route traverses downtown’s interesting crossroads full of history, commerce and outstanding architecture – if you know where to look. The tour features both modern and historic architecture, as well as beautiful parks and bridges. Nine historic buildings constructed between 1858 and 1933 are featured, all of which are listed in the National Register of Historic Places. 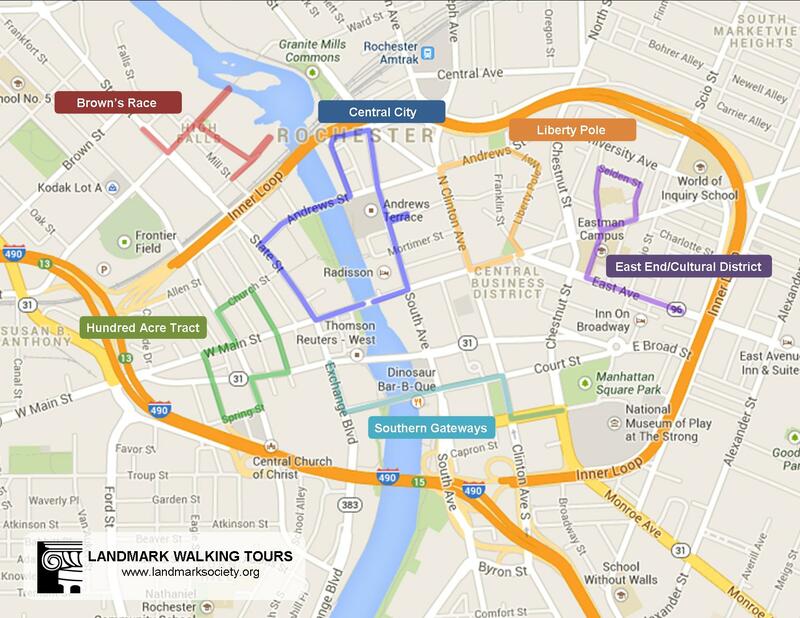 Many iconic Rochester buildings, churches, and parks are part of this tour in the heart of downtown. During most of the 20th century, the center of Rochester’s downtown was its department stores, and while the stores are gone, some of the buildings survive. You will also visit one of Rochester’s most fabulous banks, a Romanesque Revival church, and a former church that is now a tranquil and unusual downtown park. This tour begins at Rochester’s famed Eastman Theatre and Eastman School of Music that anchor the city’s cultural district. It continues through historic residential neighborhoods and urban-style restaurants, bakeries, nightclubs, and coffee shops – all contributors to the ambiance of the city’s vibrant East End. At the end of the tour, you will have the option to continue on East Avenue and view the beautiful mansions that line the street, including the former home of George Eastman.